View of one of three ancient stones, known collectively as the Devil's Arrows, found in Boroughbridge, a small settlement in the parish of Aldborough. 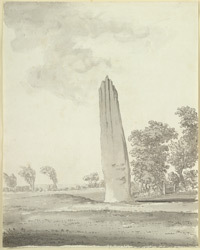 The National Gazetteer of England and Wales 1868 reports, "Near Boroughbridge are three obelisks roughly shapen of ragstone, about whose origin and character antiquarians are not agreed. They are locally named the Devil's Arrows or Bolts, and by different authorities have been assigned to a British, a Roman and a Celtic origin." There may originally have been even more standing stones here.